Polson Pirate Colton Cote 110-meter hurdles Class A State Champion. 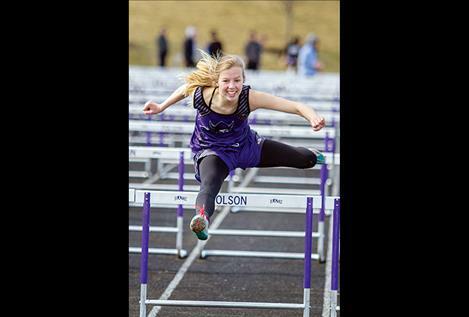 Charlo Lady Viking freshman Carlee Fryberger finishes second in the 100-meter hurdles at the Class C state tournament. The Lady Pirates attempt to turn a double play. 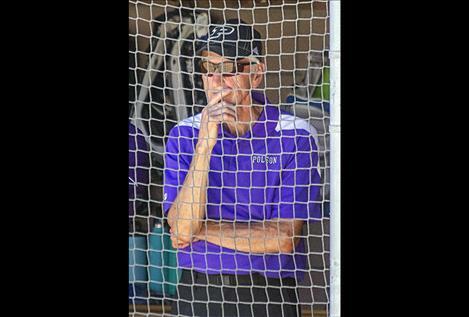 Coach Larry Smith watches his team from the dugout. 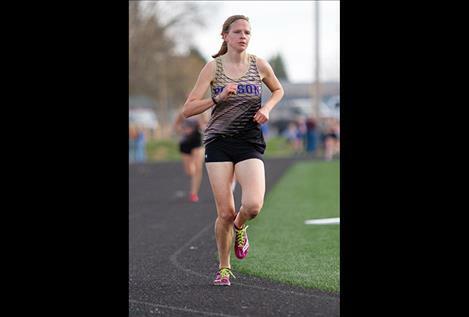 Polson Lady Pirate Bea Frissell 1600 and 3200 Class A State Champion. 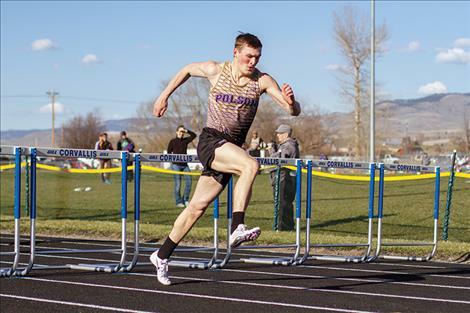 The Polson Pirate boys and girls track teams brought home individual state championships on Friday and Saturday during the Class A State track and field meet in Laurel. Bea Frissell crossed the tape first in both the 1600 with a time of 5:09.79 and the 3200 with a time of 11:23.92. Quin Stewart placed first in the 800 meter with a time of 1:59.39, while Colton Cote came in first place in the 100-meter hurdles with a time of 14.84 and fourth in the 300-meter hurdles. Other top-six performances at the meet included freshman Trenton Adler who took fifth place in the 100-meter, Mikaela Ducharme with a third place finish in the triple jump and fourth place in the long jump and Molly Sitter who took sixth place in the 3200. Top placers for Ronan were James Normandeau - tenth place in the 1600 meter and Lindsey Brooks - eleventh place in the 800 meter. The Mission Bulldogs finished their track season on Friday and Saturday during the Class B State track and field meet in Laurel with a third-place finish in the high jump by Karolyna Buck and a fifth place by Afton Brander. Michael Durglo placed sixth in the shot put and tenth in the discus for the Bulldogs. Charlo High School’s girls track and field team ran their way to fourth place at the Class C state track and field meet on Friday and Saturday in Great Falls. The 4x100 relay team, with runners Kaitlin Cox, Tyrah Hammond, Destiny Manuel and Carlee Fryberger, came in third, clocking in at 51.26, while the 4x400 team of Destiny Manuel, Kaitlin Cox, Allie Delaney and Kira McPhail placed fourth. Freshman Carlee Fryberger scampered to a second-place finish in the 100-meter hurdles with a time of 15.52. Fryberger also placed third in the triple jump and fifth in the 100-meter. Tyrah Hammond placed second in the pole vault, fourth in the 100-meter and fifth in the 200-meter, while teammate Kaitlin Cox finished fifth in the triple jump and sixth in the 100-meter hurdles. For the Viking boys, Landers Smith placed fourth in the pole vault and anchored the third place 4x400 relay team with Bridger Foust, Toby Odom and Isaiah Allik. Long distance runner Wills Degrandpre placed fifth in both the 1600 and 3200. Shawntaya Nelson was the lone top finisher for Arlee track squad with a third place in the pole vault. 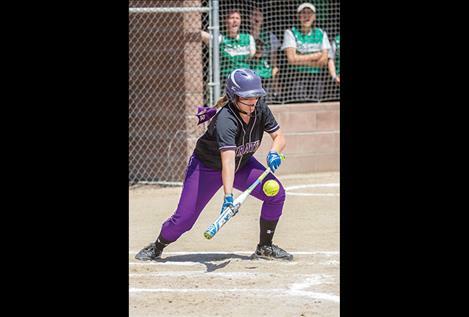 State softball Class A: The Polson Lady Pirates finished the year with an overall record of 20-6 and in the top five of the state for the second year in a row during the three-day Class A state softball tournament in Frenchtown. 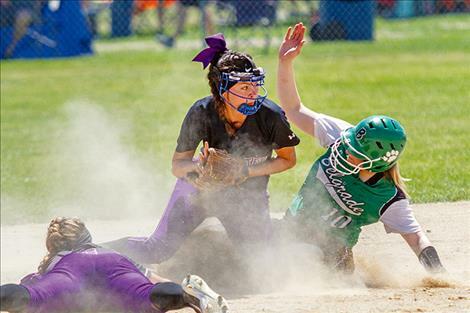 On Thursday, the Lady Pirates drew a first-round bye in the tournament and rallied from a 7-0 deficit in the evening game to beat Frenchtown 10-7. In the bottom of the fifth, Quinn Motichka tied the game with a three-run home run. Later in the same inning a double by Paige Noyes pushed the go ahead run across the plate. Kaelyn Smith and Kaylanna DesJarlais finished the game with home runs. Polson had a Friday afternoon matchup against defending and eventual state champion Belgrade. The Lady Pirates struggled at the plate in the 8-1 loss managing only one run on four hits. Facing elimination Friday evening, the Pirates fought back to down Lewistown 7-1 in a loser out battle. Vanessa Kent, who would pitch all four games for the Pirates in the tournament, shut down Lewistown allowing one run on just three hits while the Lady Pirates collected seven runs on seven hits. Hitting home runs in the game for Polson were Josie Caye and Smith. On Saturday, the Lady Pirates drew playoff nemesis Frenchtown in a loser out battle. Knotted up 8-all, Frenchtown scored the winning run on a throwing error in the bottom of the seventh ending the Lady Pirates’ season with a 9-8 loss. Lexi Orien homered in the game. Lady Pirate and future Griz Kaelyn Smith finished her high school career with a school record of 152 stolen bases. WP - Vanessa Kent; LP - Brynn Leishman. Hits - Frenchtown: Meg Delaney 4 (2 HR), Kylie Habeck, Leishman 3, Callie Bagnell, Mikaila Neilson, Kylie Willett 2 Polson: Kaelyn Smith (HR), Marina Mayorga, Quinn Motichka (HR), Josie Caye, Kaylanna DesJarlais 2 (HR), Laurel Bitterman 2, Paige Noyes, Grace Quinones. RBIs - Frenchtown: Delaney 4, Habeck; Polson: Smith, Motichka 3, DesJarlais, Noyes, Quinones, Lexi Orien. WP – Erin Elgas; LP – Vanessa Kent. Hits - Polson: Kaelyn Smith (3B), Marina Mayorga, Josie Caye, Paige Noyes; Belgrade: Madi Kreiger, Lanie Morgan 3 (2B, HR), Olivia Cook (2B), Presley Jacobsen (2B), Elgas, Khiala Rollins 2 (2B). RBIs - Belgrade: Kreiger 2, Morgan, Cook, Jacobsen, Elgas, Rollins. Kent and DesJarlais; Irvine and Kolstad. W — Kent. L — Irvine. Hits – Lewistown: Botcher, Hayes (2B), Gordon; Polson: Smith (HR), Caye(HR), Orien (2B), Bitterman, Noyes, Mayorga. RBIs – Lewistown: Hayes; Polson: Smith, Caye (2), Mayorga (2). Vanessa Kent, Ellie Thiel (5), Kent (5) and Kaylanna DesJarlais; Meg Delaney and Dana Jacobs. W — Daley. L - Kent. Hits - Polson: Smith (3), Caye (2, 2B), Motichka, DesJarlais, Noyes, Bitterman (2), Lexi Orien (2, HR), Mayorga (2); Frenchtown: Delaney, Jacobs (2), Habeck, Snow (2), Bagnell (2, 2-2B), Neilson (2, 2B, HR), Moen (2B). RBIs – Polson: Caye (2), Motichka, Noyes, Orien (3), Mayorga; Frenchtown: Bagnell (2), Neilson (3).